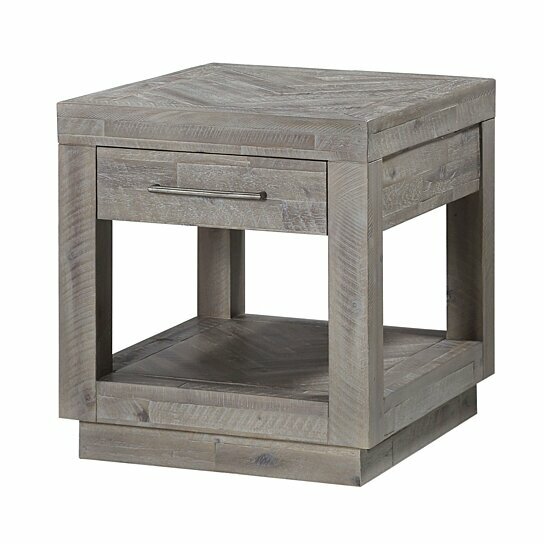 Bring tasteful, transitional style to any seating ensemble with this charming End Table. Made from solid Acacia wood in a washed gray finish, this end table features a distinctive inlay design and clean metal hardware that adds a unique combination of rustic charm and contemporary polish to your living room decor. The top drawer of this table offers storage for remote controls, a deck of cards, and other small items, while the lower shelf provides additional display and storage space. Set this end table next to your sofa to create a striking look and provide you with a spot to hold your drink, book or remote control. Note: Other featured items in image except this end table are sold separately. The table features distinctive inlay design on its surface. Made from acacia wood this table will ensure long term utilization. One drawer and One lower shelf offers ample of storage and display space.